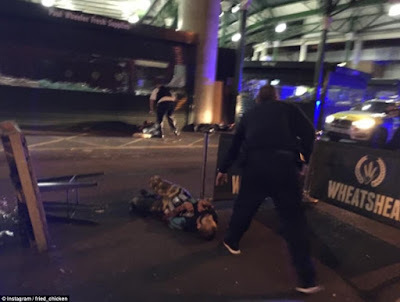 The British newspaper the Daily Mail offers a piece, along with numerous photos and video clips, of the terrorist attack in London. Three Jihadi terrorists were shot dead by armed police after killing seven people and injuring 48 others in a horrific van and knife rampage through central London last night. The men, described as being 'of Mediterranean origin', mowed down up to 20 revellers as they careered across London Bridge in an 'S shape' at 50mph before they began 'randomly stabbing' people in nearby Borough Market. Attackers shouted 'this is for Allah' as they used 12-inch hunting knives to attack revellers at busy bars and restaurants in the market, sending dozens of others fleeing for their lives. Witnesses said the gang, who were wearing hoax suicide vests, smashed pub windows and reportedly cut the throats of drinkers. A 'dark-skinned' man in a red tracksuit 'calmly' stabbed a man three times. Another victim was reportedly stabbed five times in the chest. Armed police rushed to the scene and authorities urged panicked Londoners on Twitter to 'run, hide, tell' if they were caught in the 'utter chaos'. The male suspects were shot and killed by armed police in Borough Market within eight minutes of the first call.